Are You Ready To Meet The 2018 TCFStyle Expo Sponsors? The 2018 TCFStyle Expo Sponsors have been announced! Check out who’s going to be in the building and get excited for what we have in store this year! Hey Friends! Are you getting excited for the TCFStyle Expo? Yeah girl, us too! 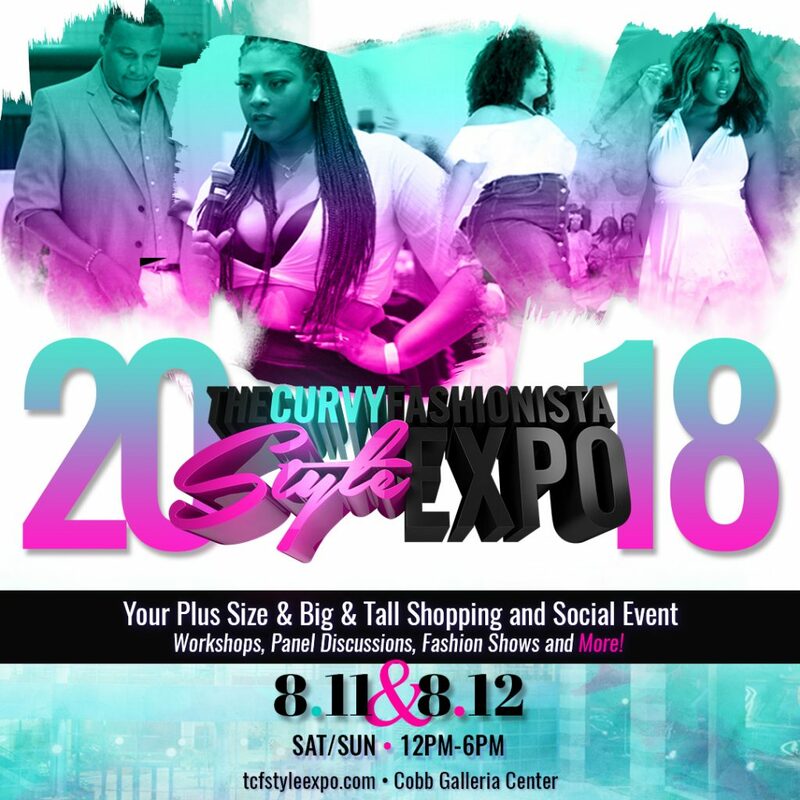 We are back with some newness, plus size fashion, fashion shows and super fun workshops and panels for our 4th annual plus size social shopping event, The TCFStyle Expo! And because we cannot do it alone, today, we thought to shine the light on a few of the sponsors who have made it happen! Not only will the event be filled with amazing plus size vendors to shop from, we have some amazing sponsors bringing you some fancy activations, events, and experiences! So let’s get into it, right? The 2018 TCFStyle Expo Sponsors! Many thanks to these brands for being TCFStyle Expo sponsors! We offer 4 levels of sponsorship from Gold to Community. So let’s talk about the sponsors! Listen ladies, the men said that they are here to show us up this year and this sponsor is here to support this notion 100%. MVP Collections wow-ed us at Full Figured Fashion Week this year and we’re excited to have their support for the TCFStyle Expo. A quick rundown of what you need to know about MVP Collections: If you have a big and tall man in your life (I do!) then this is one of the top places you need to be shopping for him. They offer everything from activewear to jackets in the sizes our fellas need with the reminder that “good style has no size”. Yaaasss!! Lane Bryant has been a leader in the plus size clothing industry for some time. Like they are OG’s of the plus size community! Also: have you seen their summer collection? I need all the pieces! Have you ever laid down and fallen asleep immediately? I’m not saying that this is what happened exactly when I sat on the bed but it almost did! Big Fig Mattress is a retailer that makes mattresses specifically for the plus size person. Sweet dreams for sure! Mediavine is hands down the best digital ad management service! ELOQUII is quickly becoming a household name for the plus size community. Their cutting edge styles along with their designer collaborations are really making them a standard necessity for our closets! Koils by Nature offers healthy hair solutions for both men and women. Whether you need edge control or beard moisturizer, they’ve got you covered! Talk about grace and class. That’s always what comes to mind when I see the new pieces at Catherine’s. Friends. If you’ve not heard of MedZone’s products, I’m saying a prayer for you! MedZone is the creator of ChafeZone–the fighter of chub rub. This.Is.Exciting. Everything from fanny packs to Ankara print skirts and tshirts are offered at Contagious Curves! If you’re looking for dope, one of a kind accessories, then Sassy Jones Boutique is for you. They even offer a monthly box! ALLGO is an app designed to give the real deal on how others react to plus size beauties being in their establishment. Not sure if you’ll be treated with kindness? Pull up the app! Mistreated? Rate the business. ANd Guess what? This is not all of them! I cannot wait for you to meet all the TCFStyle Expo sponsors!!! No worries, get your tickets now, at TCFStyleExpo.com! And to help you out, we have a few cool options, like buy more, save more! We know you are coming with your homegirls, so the more you buy, the more you will save! Ohhh and if you are a blogger or thinking about blogging, make sure you check out our Blogger Mastermind Day, Presented by Mediavine!